I couldn’t have asked for a better day for the necessities of aloneness and research. It was such a fine day — clear, sunny, calm. And I think it was “useful” too, in terms of my work, though one doesn’t always know what details will be useful as the novel proceeds. But it was also a lovely day quite apart from any usefulness. And if you’re interested, here’s a bit of it. 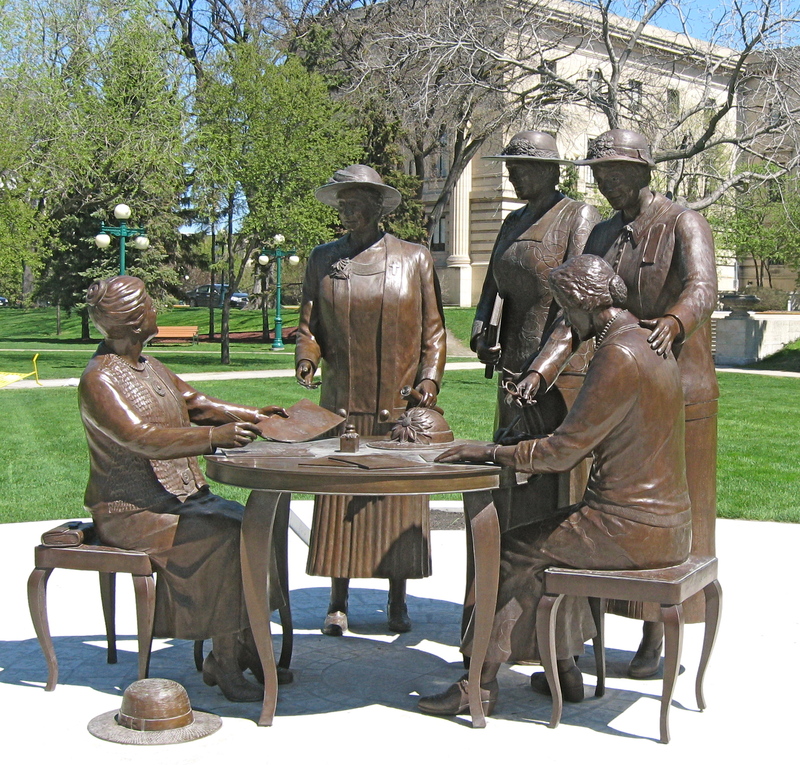 The "Famous Five" -- Nellie McClung is seated, right. 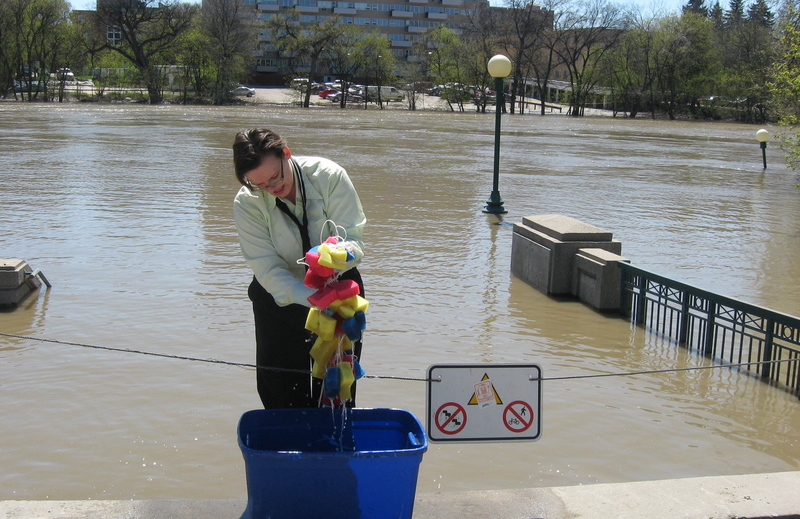 Wandering along the river (though not on the river walk, which is submerged) I saw two women busy with something else: dipping strings of sponges into the Assiniboine River which they then squeezed out into square containers, only to dip into the water, pull up, and squeeze again. I learned that it was a piece of performance art intended to draw attention to (and raise money for) the plight of so many in our province who have been flooded, or will be flooded, as provincial officials do a controlled release of the overflowing Assiniboine River. Some are being flooded to save others. Tough decisions and tough times, too easy to forget while safe and dry on such a gorgeous day. How laborious and almost futile the sponge-squeezing efforts to “mop up” seemed. Indeed, what does one do with so much water? Where can it be put? I sat for a while in a small park off Assiniboine Ave., enjoying the sun and reading in Eudora Welty’s memoir, One Writer’s Beginnings, in the first part called “Listening.” (The other sections are “Learning to see,” and “Finding a voice.”) I read, and remembered sounds from childhood that her memories brought to mind, and I sat there, listening too. To the continuous traffic of a city, to helicopters above (wondering where to put all the water? ), to a train coming into the station (which sounded solemn and important until its brakes started to squeal), to the laughter of a group enjoying the sun nearby. I continued my wanderings to the Forks, which was brimming with people today, and then along Waterfront, and finally back up to Main to catch the bus home. A final soundscape of note concerned an exchange between the bus driver and a passenger. The passenger was being obnoxious, and swearing, and the driver halted at the next bus stop and told him to get off. Because of his language, he said. Ironically, the driver’s orders included some surprisingly colorful language as well. Eventually, however, after some further words back and forth, the protesting passenger exited and staggered on to a bench to wait for the next bus (! ), transfer in hand. We pulled away, obscenities trailing after us. And then, the noise of the traffic and the noise of the bus engine notwithstanding, it seemed quiet. 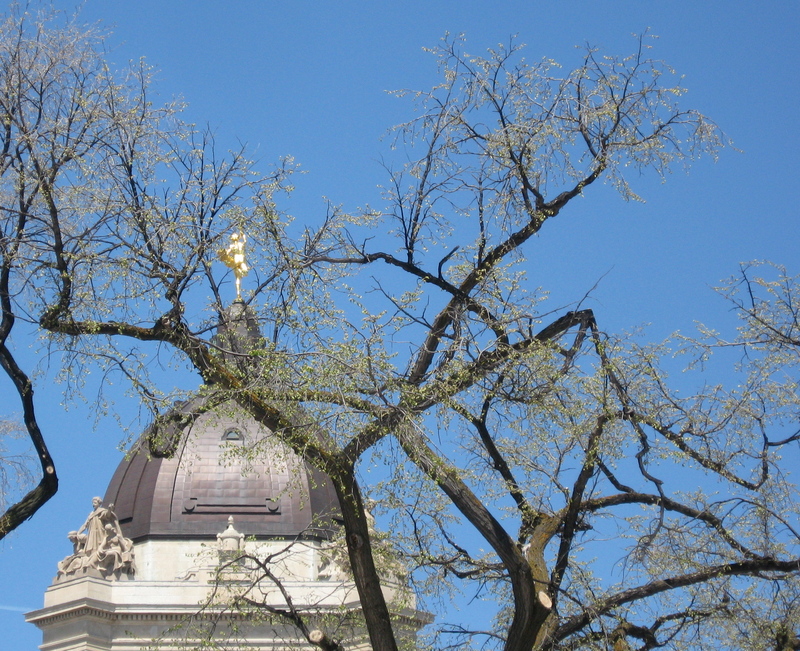 This entry was posted in Personal, Writing and tagged Augustine United, Eudora Welty, Golden Boy, listening, Manitoba flood, Nellie McClung, Soaking Up Donations by doradueck. Bookmark the permalink. I enjoyed the cityscape, since I am anticipating a year in NYC starting in August. You offer some ways to keep writing going during that time. Why Shirley, the Welty book is from your “list” of course! I’ve read quite a number of them on your “top” list, but not all and am inspired to at least add some of your picks. That you’ve reached your goal of 100 amazes me. — Eudora Welty is so wonderful with sounds: the rocking chair makes a clicking sound like crickets, the butter churn sobs, an electric fan has “a steady seething sound” — It all inspires me to keep thinking about what sounds are like. — And, did I somehow miss something? What will you be doing in NYC for a year?